While 2017 was a year of smooth sailing, 2018 has started with some rougher seas. The VIX is a measure of market volatility, the higher the number the more volatility. In 2017 the VIX often floated around 10 and peaked around 16. So far this year the VIX has hovered around 20 and at one point spiked to 36. 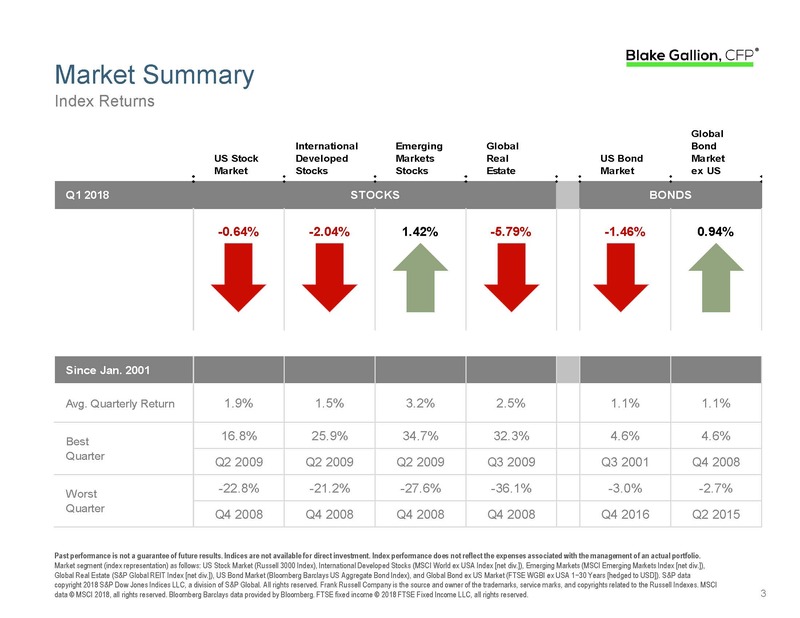 Regarding market returns, after initially climbing, both the US and international stocks ended the quarter with slight declines, while emerging markets had moderate gains. Interest rates in the US rose during the quarter, bringing bond prices down, while the global bond market had small gains. Planning note: The tax filing deadline is Tuesday, April 17th this year. If you are eligible to fund retirement accounts and have the means to do so but haven’t, you can still make 2017 contributions. Talk to your tax preparer or feel free to contact me if you have questions about plans you may be eligible for and contribution limits based on your circumstances.